A higher percentage of Maryland students are crossing the stage to receive their high school diplomas than at any other time in the State’s history, according to data released this month by the Maryland State Department of Education. As the graduation rate sets new records, the dropout rate has reached an all-time low. The four-year cohort graduation rate reached 87 percent in 2015 -- 5 points better than the 82 percent rate registered in 2010. The graduation rate jumped 0.6 percentage points over 2014, from 86.4 percent. • Four-year cohort graduation rates for African American, Asian, Native Hawaiian and White students all improved, as did the rate for students identifying as two or more races. • The graduation rate for African American students has jumped from 76.09 in 2010 to 82.3 percent in 2015. • The graduation rate for Hispanic students dipped by 0.6 percentage points between 2014 and 2015, but has improved by more than 5 percentage points since 2011, from 71.7 percent to 76.9 percent. • Among students receiving special services, the four-year cohort graduation rate rose in two of three categories. Specifically, both special education students and students receiving free or reduced price meals improved. But the percentage of English language learners graduating fell from 54.1 percent in 2014 to 49.3 percent in 2015. Maryland six years ago moved to the cohort graduation rate, which follows a set group of students from freshman year through their senior year. The four-year cohort graduation rate has improved every year since. Simultaneously, the dropout rate has been in steady decline. The State’s dropout rate, which stood at 11.9 percent in 2010, dropped to 8.1 percent in 2015. 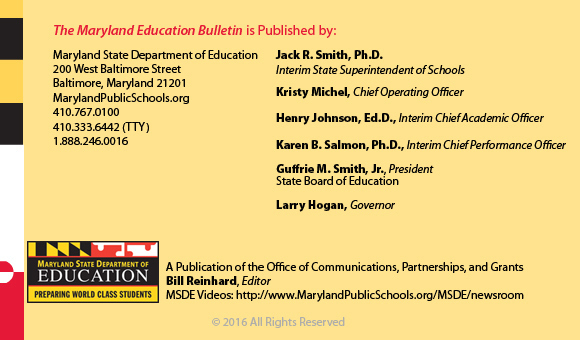 The new high school and system data are available on the Maryland Report Card website. Maryland students have led the nation in success on the Advanced Placement (AP) exams for 10 consecutive years, according to new data from the College Board. The percentage of Maryland seniors who earned a score of 3 or higher on one or more AP exams broke 30 percent for the second consecutive year -- 31.7 percent in 2015. That represents a slight dip from 31.8 registered in 2014 but a big jump from 2005, when 20.6 percent of Maryland seniors scored a 3 or higher. That was the last year Maryland did not lead the nation on AP success. A score of 3 or better is the threshold at which many higher education institutions award college credit tor high school students on an AP assessment. Maryland is followed by Massachusetts with 31.5 percent of seniors receiving a 3 or higher. Florida, Connecticut, and California all had more than 30 percent of seniors scoring a 3 or higher. The national average was 22.4, up from 21.6 percent in 2014. The new statistics are included in AP cohort data the College Board recently released for the class of 2015. The data release replaced “The AP Report to the Nation” in 2014, which the organization had published for the previous decade. • More than half of all Maryland high school graduates take at least one AP exam while in high school, and that tally has nearly doubled over the past decade. In 2005, 30.7 percent of Maryland graduates had taken at least one AP exam during their high school career. By 2015, 51 percent of seniors were taking at least one of the rigorous exams. Only the District of Columbia (70.1 percent), Florida (57.7 percent), and Arkansas (51.1) had higher rates of participation. • The number of Maryland high school seniors who scored a 3 or better on an AP exam increased from 11,180 in 2005 to 17,314 in 2015. • Maryland’s low income students in the Class of 2015 were underrepresented in the AP program. While 42.8 percent of Maryland seniors were eligible for free or reduced-price meals they only comprised 20.9 percent of AP test takers, and 16.5 percent of those who received a grade of 3 or better. The College Board’s Advanced Placement Program, which began in 1955, allows students to pursue college-level studies while still in high school. Students of different interests and backgrounds can choose from more than 30 courses to demonstrate their knowledge of rigorous academic curriculum. Visit AP for Students for more information on the program. One of the great pleasures of my job is the ability to salute some of Maryland’s outstanding educators. I had the chance to do that last week, visiting Oxon Hill Middle School in Prince George’s County, when science teacher Angela Malone became Maryland’s latest Milken National Educator. Angela received a $25,000 check in front of a gymnasium full of students screaming their approval. She is one of 40 educators who will receive the prestigious national honor during the Milken Family Foundation’s (MFF) coast-to-coast tour across the country during the 2015-16 Awards season. MFF has been rewarding outstanding elementary and secondary educators with the Award since 1987. Malone is the 60th recipient in Maryland since the program was implemented in our state in 1993. Angela brings energy, innovation and exceptional standards to her classroom every day, strengthening student achievement. She exemplifies what it means to be a Maryland educator, and we are thrilled that the Milken Family Foundation honored her work and dedication. Maryland this week honored six schools with Excellence in Gifted and Talented Education (EGATE) School Awards, which recognize top elementary, middle, and high school programs. Now in their sixth year, the EGATE awards spotlight gifted and talented programs aligned with Maryland Standards and regulations for Gifted and Talented Education. Each EGATE nominee submits a comprehensive application, which provides documentation of 21criteria of excellence under four program objectives: student identification, curriculum and instruction, professional development, and program management and evaluation. In the six years of the award’s existence, 39 schools from 10 school systems have earned the EGATE status. Members from the Maryland Advisory Council for Gifted and Talented Education and local school system personnel review and score the EGATE applications, which document the school’s gifted and talented program activities over a 15 month period. Sean McComb, former National Teacher of the Year, talks about the influence of two teachers in his high school years. Maryland names six 2015-16 Maryland Blue Ribbon Schools. Maryland names six 2015-16 Maryland Blue Ribbon Schools. All six are called to MSDE headquarters on the premise of a policy discussion. Watch the announcement!